A female orca, or killer whale, travels with her offspring in waters around the San Juan Islands in Washington State. Environmental groups sued the Obama administration on Thursday for granting the Navy permits to test underwater sonar along the West Coast -- and potentially harass up to 650,000 porpoises, seals, dolphins and whales over a five-year period. The alliance said it wasn't seeking to stop the testing but to scale it back, especially at certain times and in waters important for feeding and giving birth. Several studies have found that marine mammals can hear low-frequency sonar, which is magnified under water, and periodically dolphins and even whales have been found with perforated ear drums. The National Marine Fisheries Service "fell down on the job and failed to require the Navy to take reasonable and effective actions to protect" marine mammals, Steve Mashuda, an attorney for the law firm Earthjustice, said in a statement. The lawsuit, filed in U.S. District Court in San Francisco, claims that the Navy's sonar use might be strong enough to kill the animals outright. But even if it doesn't, it claims, the repeated use of sonar in certain critical habitats is unwarranted. In 2010, the fisheries service approved the Navy's five-year plan for operations in the Northwest Training Range Complex, an area roughly the size of California that stretches from Washington state to Northern California. Under the five-year plan, the service said it was acceptable for the Navy to incur up to 650,000 cases of harassment of marine mammals. Regulators determined that while sonar use has been associated with the deaths of whales around the world, including the beaching of 37 whales on North Carolina's Outer Banks in 2005, there was little chance of that happening on the West Coast. The short duration of the sonar use, typically 90 minutes at a time by a single surface vessel, and reduced intensity would help prevent whale deaths, they said. Regulators are requiring the Navy to shut down sonar operations if whales, sea lions, dolphins or other marine mammals were spotted nearby by ships in the water. But the plaintiffs argue that visual mitigation is ineffective. 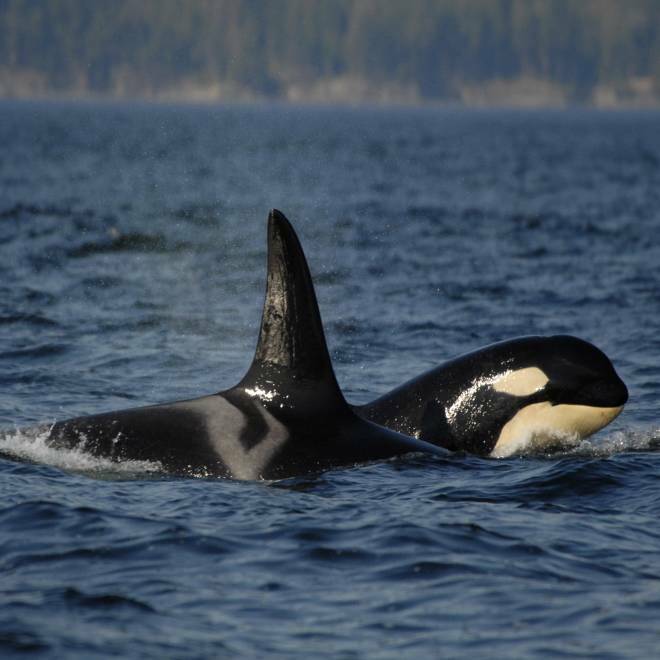 "Visual detection can miss anywhere from 25–95 percent of the marine mammals in an area,” stated Heather Trim, policy director for People For Puget Sound. "It’s particularly unreliable in rough seas or in bad weather. We learn more every day about where whales and other mammals are most likely to be found — we want NMFS to put that knowledge to use to ensure that the Navy’s training avoids those areas when marine mammals are most likely there." A spokeswoman for the Navy declined to comment, saying she had not seen the lawsuit, and the fisheries service did not immediately return an email seeking comment.